I watch a lot of movies. I usually make reviews of movies that are either obscure or what others consider irrelevant. There are thousands of blogs out there talking about the same movies> I try as much as possible to steer away from those movies (if possible) and try to review the small movies of world. I haven't been out watching movies for a long time. It's been a busy time for me since I had been doing some extra work in the office after my shifts. I haven't had any time for myself for more than 3 weeks. Then I decided to take the time to watch a movie in G1. Now let me tell you about The Jacket. 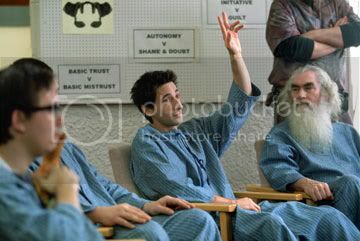 But first, let me tell you about Adrien Brody. Adrien Brody is an effective actor. "Effective" means that he is a well honed, well skilled tool for his director in helping him make a great script come to life.His physical features helped Roman Polanski bring across a weak but resourceful Jewish survivor in The Pianist. His erratic persona made him effective as the cocaine addicted photojournalist in Harrison's Flowers and the mentally retarded best friend in The Village.He may not have the same charisma as DeNiro, Cruise or Crowe, but he sure does make his director look good. 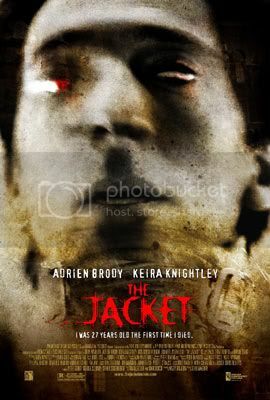 In The Jacket, Brody plays Jack Starks, a Gulf War vet who gets shot in the head and survives but gets into a series of situations where he gets committed into a mental institution with a Frankenstein like doctor played by Kris Kristofferson who performs experimental 'simulation' procedures on his patients to 'correct' their behavior. Keira Knightley is Jackie Price, a woman from his alternate reality who is helping her solve the great mystery of his predicament. I have to be honest, I have read one or two articles about The Jacket previously. When I actually got to see it, It wasn't the movie I expected it to be. Actually, the movie starts out as some sort of war-realted drama and has the feel of an independent human drama. Then it turns into a Seven-ish scratchy, blippy, synapse filled eye trip that could get you into an epileptic seizure. The story is very original and it doesn't have any of the overdone twist endings that are grossly overdone these days. It's a very effective drama/thriller as that it has both elements and they interplay with the story in a very realistic manner. I thought this was going to be another controversial Gulf War drama with political undertones, which was my original idea , however, early in the film it steers a totally different direction and totally abandons the war angle and concentrates on the uncanny adventures in the jacket he gets to wear and the 'box' he gets inserted into. For some reason, this movie reminds me a lot of The Machinist, probably because it's darkly lit sets and the anemic looking protagonists of both movies, but for the most part because of the 'jumping' time dynamics of the story. Don't look for any idealistic opinion-changing viewpoints here. Instead, enjoy it as it really is, a story of a man in an extraordinary circumstance that borders the paranormal, trying to find himself and gain true happiness. "Long Live the Organization for the Organized!" a few days ago, i had time to kill. at dahil may pass ako for a movie at g4 cinemas, i decided to watch a movie. good enough, showing pa ang jacket. ang totoo, hindi ko binasa ng buo ang review mo pero since u made a review out of the movie, i got interested in it. at first, i thought scary movie sya.. nde pala. in a way, it was nice enough to last me the whole time i was sitting by my lonesome. made me wish na sana i have the chance of going back in time to make changes... ay..going to the future pala to see what happens because of what i'm doing now. ehehe wishful thinking. I liked your review about this movie. Without any interest I watched it at my friends house and didn't gave much attention to it. But after reading your review I really wanted to see it once more. Michael Bay to Direct Transformers? Noooooo!! !